MOLLUSCA : NUDIBRANCHIA : Tergipedidae SNAILS, SLUGS, ETC. Description: The full coloration of this nudibranch is only developed in adults. The cerata bases are flushed with red and splashes of white pigment cover the dorsal surfaces of the cerata, becoming more continuous towards the tips. The rhinophores have a band of dark reddish pigment halfway up their length, and are predominantly white above this. The dorsal surfaces of the oral tentacles have a continuous band of white pigment, and this distinguishing feature is present even in juveniles. Adults are normally about 12-15mm. in length. Habitat: The food of this species is the hydroid Halecium halecinum and specimens may be found wherever this common hydroid occurs, usually on rock surfaces in semi-sheltered sites with some tidal stream movement. 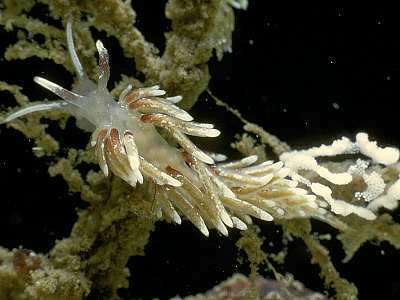 The spawn is a thin ribbon tangled amongst the hydroid branches. Distribution: Found all round the British Isles from as far north as Orkney to Cornwall in the southwest and on both the east coast and west coasts. Similar Species: Rubramoena amoena is a closely allied species also feeding on Halecium halecinum. It has a brown band in the middle of the oral tentacles. Oral tentacles with white pigment on their dorsal surfaces. Red pigment at the bases of the cerata. Picton, B.E. & Morrow, C.C. (2016). Rubramoena rubescens (Picton & Brown, 1978). [In] Encyclopedia of Marine Life of Britain and Ireland.